I made these specifically for the local Arts Festival that was featuring a Craft Fair this year. My fear of commitment kept me from signing up for the entire 10 days (whew...10 days is a loooong time!) Kim from Kim's Kandy Kreations let me use some of her space. I think I'll pass on that Fair next year. 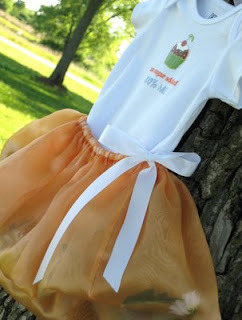 In the mean time, I had so much fun making these Tutu's I may just have to make more! For all those little Garden Fairies who love to dance in the flowers under the sun's sparkling rays! 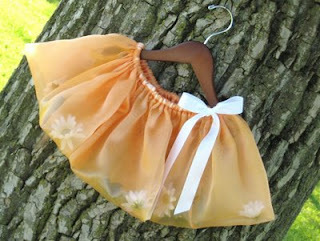 Made from Orange Organza and filled with White Daisy's and Green Leaves. 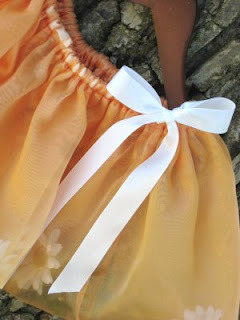 It has a White Satin Ribbon Drawstring for little Fairy Princesses with tiny waists.